On Thursday, Friday, Saturday and Tuesday nights, you can now partake in a special sound and light show at the Bahrain Fort. 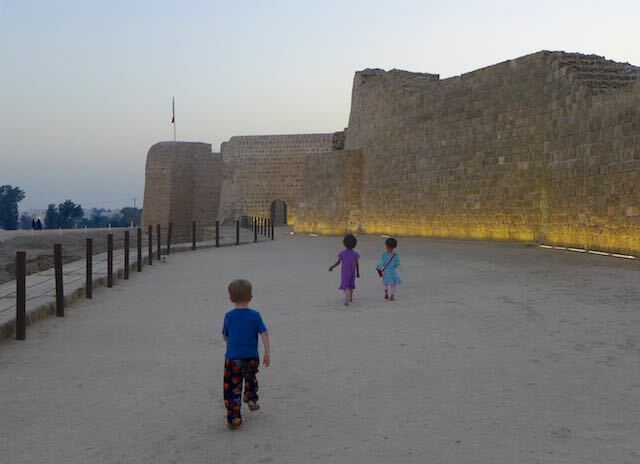 For thirty minutes, you can be whisked away into the history of Bahrain and the Qal'at al-Bahrain (fort), from Gilgamesh through the Portuguese up until the present. The show is well-paced with clear interesting narration and captivating graphics. Tickets are sold at the fort’s gate (not at the museum). They are 3BD per person, kids 6 and under are free; kids 7 and above are 1BD, as are university students (who need to show an ID). There are two show times: the 6:00 p.m. show is in English, and the 7:00 p.m. show is in Arabic. These show times will continue up to June 1, however they may change during Ramadan. You can call +973 39127899 to reserve a ticket (although it wasn’t needed when we went). You can park at the fort’s lot, or even down by the Bahrain Fort Museum where there is more parking and then walk up. Get there a little early and you’ll have a chance to explore the fort at night before the show starts. This was a huge hit for our littles. There is seating for the show and on these March and April nights, the lights and weather make for a great excuse to bring the family out.